My name is Ralph Anderson. I died on 12 May 2018 from complications of old age. Services will be performed at St. Sebastian’s Catholic Church, 3126 95th St., Sturtevant, WI at 11:00 a.m. on Thursday, May 17, 2018. Visitation will start at 10:00 a.m. until services. Entombment with Full Military Honors will follow at Graceland Cemetery. In lieu of flowers, a memorial gift may be made to St. Gertrude the Great Catholic Church, PO Box 599, Mora, New Mexico 87732. Please be generous for this is a rural parish with ten mission churches. I thank you on their behalf. I was born and raised in Racine, Wisconsin. My parents were Ralph N. and Gertrude “Walrath” Anderson. I survived both my parents and two brothers, Lawrence and Donald Anderson. I have been truly and generously blessed in my life. The first and greatest of those blessings was my marriage to Mary Jane Bieneman. We were wed on the 5th of September in 1947. We spent over 60 years together in a life that was filled with happiness, humor, adventure, and above all, love. The blessings multiplied as our three sons arrived: Richard N., deceased, Robert N., Cornwall on Hudson, NY, Ronald N. of Santa Fe, NM. We were proud to see all three serve as officers in the military; we were also delighted to see them fulfill the same promise of love as we had by marrying and choosing women who also contribute to their success. We have one grandchild, Colin Anderson of New York, NY. I will truly miss them all. I wish them the good fortune of finding the kind of support I did with the Lost and Found group of Racine, WI. They have been invaluable in their friendship. As a believer in the value of education, I am proud to note that I graduated from Washington Park High School in 1943 and obtained my B.S. degree from Marquette University in 1949. In order to demonstrate my interest in life long learning, I attended Wayne State University of Michigan, The University of Wisconsin at Madison, and Wharton Business College, Pennsylvania. Community and the importance of building community were virtues I believed in, and therefore, I was a lifetime member of the following organizations: Knights of Columbus, Military Officers Association of America, and the Veterans of Foreign Wars and was affiliated with many other social and professional organizations over the years. In June 2014, I was honored to be inducted into the Washington Park High School Hall of Fame. I served in the Army/Air Force from the 22nd of February 1943 to the 22nd of February 1970. 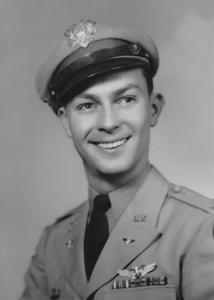 I flew 33 combat missions with the Eighth Air Force in England from March through September of 1944. I earned a Distinguished Flying Cross, four Air Medals, and received Commemorative Medals such as the D-Day Invasion and Cold War Victory. I retired as a Lieutenant Colonel. In civilian life, I worked for GAB Business Services, Inc of New York, New York, a subsidiary of UAL. My responsibility with the company was to provide business services to major corporations and governments. I ultimately served as the secretary for the company for 20 years in New York City. My assignments were varied and examples include serving on the Committee for the Development of the National Flood Insurance Program in 1969/70 and chairing the Committee for the United States Coast Guard’s Off Shore Oil Pollution Program in 1979/80. In addition, I led the first response team for two FEMA catastrophes in the early 1980s, one in Houston, TX and one in north central New Mexico. There were many other interesting assignments, but they are too numerous to mention here. We retired to a small cattle ranch that we owned in Guadalupita, New Mexico. While there, I chaired an Economic Development Committee and with the help of Senator Pete Domenici and Congressman Bill Richardson, we obtained $16 million for the construction of the Mora National Fish Hatchery. It is with pride that I note that this fish hatchery is the only one of its kind with the capability of developing both cold and warm water fish utilizing recycled water, and it continues to serve the community. I lived a full, complete, and happy life with my beloved partner, Mary Jane, without whom I would not have accomplished so much. It is with no regrets that I bid farewell and God bless.